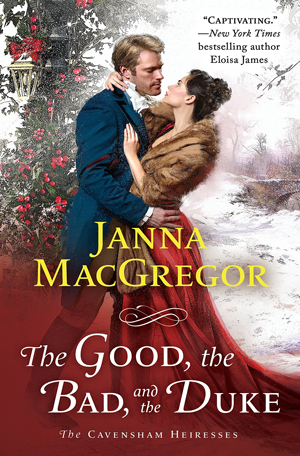 THE GOOD, THE BAD, AND THE DUKE by Janna MacGregor romps through London with another of THE CAVENSHAM HEIRESSES. This one is book four. Upon the death of his father and his oldest brother, Lord Paul Barstowe became the Duke of Southart. Always considered the spare heir by his father, Paul feels ill-prepared and not necessarily well-received for this new station in life, due to his past transgressions. He is trying to redeem himself through a hospital charity to advance treatment of rheumatic fever for those suffering like his late brother. And by apologizing to those he offended in the past. In Paul’s defense, his father always treated him with disrespect, which probably attributed to his devil-may-care attitude. Even after his death, his father torments him with continuous small debts just to embarrass him. What more can he do to him from his deathbed? Time will tell. But Lady Daphne Hallworth, one of the Cavensham heiresses, knew Paul as her brother’s best friend and has special memories of his kindness to her as a young girl. Even though Paul thinks of her fondly, and is grateful for her belief in him, her family hates him and will never approve of them together. But fate is a funny thing. When almost spinster Lady Daphne is overlooked as the family leaves for the holidays, each thinking she has gone with another, she finds herself alone in London for Christmas. Not wanting to ruin her brother’s holiday by asking him to come back for her, she decides to celebrate alone. When a young thief steals her reticule in the park, he steals more than her money. Her reputation, as well as her family’s, is in jeopardy if a certain gossip rag reporter gets his hands on her journal. This is just the beginning of the trouble she gets into with and without Paul, who tries to help her. I picked this book for review because I do love a Regency Christmas-themed romance. It wasn’t what I expected, as I was hoping for a house party full of family and friends. I do love a reformed rake, but I just never warmed up to this one and found his obsession with his lust irritating. Even though he acted like he wanted to do right by Daphne, he did things they both might regret. I didn’t feel he put her first as much as he thought he did. Paul is very down on himself and what he’s done in his past. He wants approval of his peers, especially since he’ll be working with them in Parliament. But he struggles with good-guy/bad-guy syndrome, always a step away from falling back into his past. He seems like a real sad sack sometimes – not the self-assured guy I thought he would be. Daphne, on the other hand, has always been the good girl. She’s ready to do what she wants without her family’s approval. I get that she’s seeking her independence, but she pushed the boundaries, even when Paul asked her to stay out of a situation that could be her ruin. I began to doubt her good sense when she wouldn’t listen to reason. But she also has her sister’s death haunting her, which helps her sympathize with Paul. All this sounds like a good novel, but repetitive descriptions and situations made me think it would have worked better as a novella. I’ll be curious what fans of the series think, because I think I should have been more familiar with these characters to appreciate their story more. I really wanted to like this couple, but they continued to rub me indifferent with their behavior. I think the author did a good job explaining how all the characters were related to one another, so I didn’t get lost. The villain is extra creepy and well thought out for this time period. His nasty gossip rag entitles him to do whatever he wants without thought to anyone’s feelings. Pretty much like cyber bullying today. A catch-me-if-you-can romance, THE GOOD, THE BAD, AND THE DUKE takes readers on a merry chase through seedy locations a lady should never tread. Their battles over good and evil often elicit a good chuckle. Good girl Daphne wants to be a little bad with the right man who hopefully can keep her out of terrible trouble. The epilogue will make you smile.